Three friends hit middle age in various stages of crisis: Mitch (Billy Crystal) is stuck in a dead-end job; Ed (Bruno Kirby) has never resolved issues related to his father; and Phil (Daniel Stern) hates his wife and is having an affair. The three head-off to a cattle-drive vacation in the southwest. The trio evolve from hapless city folks to hardened cowboys and are unexpectedly forced to take charge of delivering the cattle. 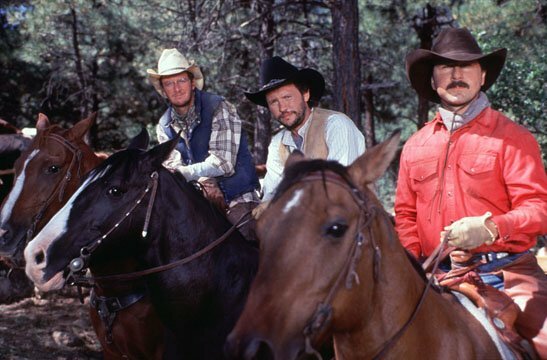 A comedy that mostly strikes a fine balance between laughs and exploring the meaning of life, City Slickers works thanks to the appeal of the three lead actors, and a sharp cameo from 73 year old Jack Palance, in an Oscar-winning role as Curly, the lead cowboy on the cattle drive. Curly is tough as nails but helps Mitch to rediscover what matters in life. The film doesn't escape some poor cliches, including an over-the-top raging river scene, secondary characters that are firmly trapped in a single dimension, and simplistic syrupy resolutions to major challenges in the lives of the three men. But the screenplay (Lowell Ganz and Babaloo Mandel) and Ron Underwood's directing maintain a decent amount of forward momentum, the laughs are plentiful, and some of the cinematography revisits the vistas of the grand classic westerns. Along with 1989's When Harry Met Sally, City Slickers helped to establish Billy Crystal as one of the comic stars of the early 1990's. He nails the jaded Mr. Everyman who has long since lost his spark, and he delivers an endless stream of clever one-liners with understated finesse. Daniel Stern and Bruno Kirby are good in support, but less well-rounded. City Slickers has a few stray heads of cattle, but the herd generally moves confidently in the right direction.